Dubai, UAE, October 30, 2018: Mr Kamal Vachani. Hon. 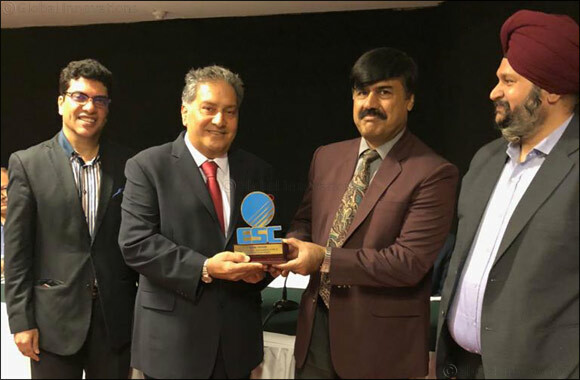 Regional Director of ESC was honoured by Electronics and Computer Software Export Promotion Council (ESC) in Delhi by Shri Sanjay Chadha, Additional Secretary, Ministry of Commerce, Government of India. The ESC award was given to Mr Kamal Vachani in recognition of meritorious services rendered and for continuous participation of ESC in GITEX. Electronics & Computer Software Export Promotion Council (ESC) is India’s apex trade promotion organization mandated to promote India’s electronics, telecom and IT exports to global markets.